Spray waffle maker with cooking spray; heat waffle maker. Separate dough into 5 rolls; set icing aside. For each waffle, place 1 roll in center of waffle maker; close lid of waffle maker. Bake 3 to 4 minutes or until waffle is thoroughly cooked and golden brown. Be sure to spray the waffle iron in between each waffle. 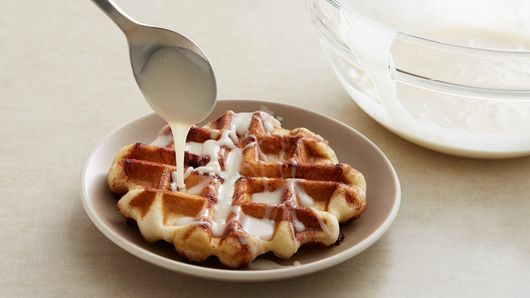 The sugar from the cinnamon roll can make the waffles stick. These are also delicious served with real maple syrup instead of the cream cheese glaze. Add some toasted pecans for extra crunch. Our favorite waffle iron to use for this recipe is a Belgian waffle iron. Belgian waffles are characterized by their circular shape, larger grid pattern and deep square pockets that are perfect for housing pools of syrup or glaze. 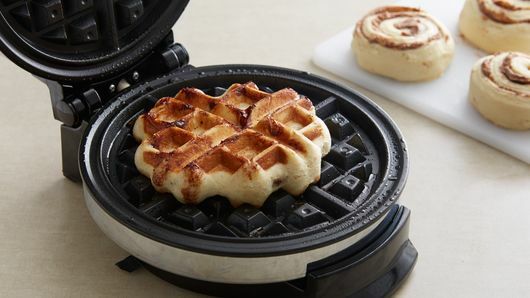 American waffle irons have a smaller grid pattern and the square pockets aren’t quite as deep—you can use any waffle iron to make this super easy cinnamon roll waffles recipe, but if you want to get the best results, go with a Belgian waffle iron. These are readily available in the kitchen section of most superstores. Want a step-by-step guide to show you how to make the best cinnamon roll waffles possible? We have an article for you read. Once you’ve mastered this recipe, try more incredible twists on breakfasts by exploring all of our best pancakes and waffles recipes.